The best Midcentury destinations are often the ones you just happen upon while out and about doing something totally unrelated. 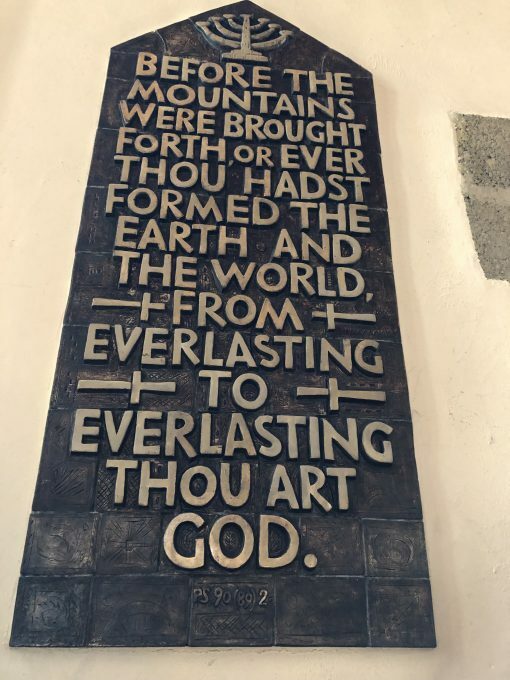 And this is exactly what happened to me after my love of all things holistic recently led me to a day retreat at Aylesford Priory, a Carmelite monastery in the heart of Kent in England, UK. Set back from the tree-lined River Medway The Friars is the principal house of the Carmelite religious order that came to Aylesford in Kent in 1242. There are still working monks at The Priory that boasts on its website (and rightly so), “one of the finest intact medieval courtyards in England, 17th-century thatched barns and a hostelry for pilgrims dating to the late 1200s”. You can book in and stay here in one of the monks old rooms with its hidey-hole and bare essentials. The place, while far from ostentatious like the gold-strewn Catholic churches often seen in our travels, is stunning. 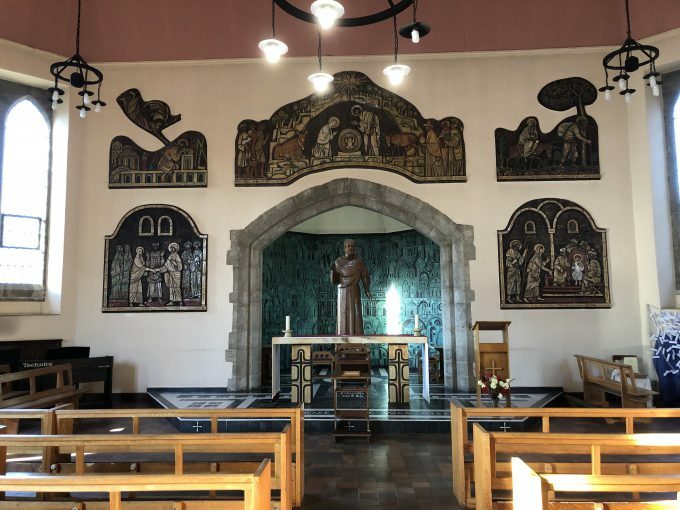 I vowed as I arrived at the old monastery to visit again with everyone I hold dear even before I saw the midcentury jewel in the crown that was set within the grounds. Following Tai Chi, Yoga and relaxation we were given time to reflect between lunch and 2pm and it was during this time on a walk around the grounds that I felt particularly drawn towards buildings within the central part where the Carmelites have an outside altar and some surrounding chapels. The Carmelites of Aylesford were forced from their priory in 1538 but returned 400 years later in 1949 when the priory came up for sale, and they celebrated their return by updating The Friars which had become an important centre for scouting activities with Lord Baden-Powell even visiting on one occasion. 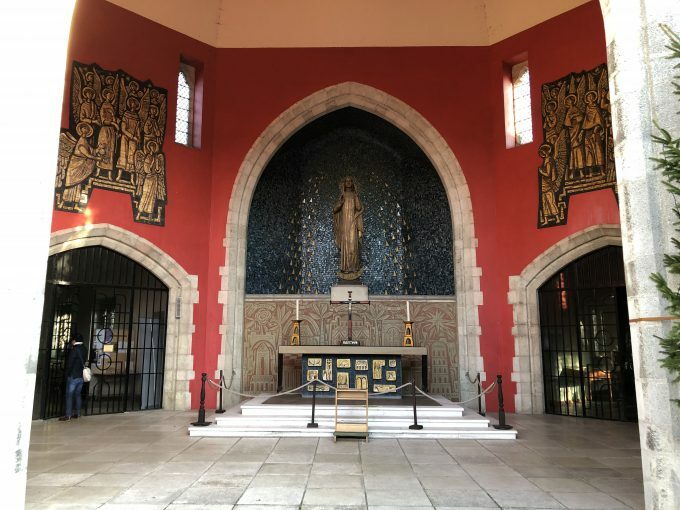 Left tarnished by fire, with marks from scouts left in the woodwork and scuffs around the edges, Friar Malachy Lynch began the task of restoring the buildings in partnership with Adrian Gilbert Scott who helped gather craftsmen and artists to help. Work began on building the Shrine and surrounding artworks in 1958. Most outstanding among the artists is Adam Kossowski, a Polish war immigrant, who made the ceramics you will see everywhere. Kossowski was imprisoned by the Russians during the second world war and got five years of hard labour in a part of the Gulag which is called Peczlag, on the river Peczora which runs into the Polar Sea. 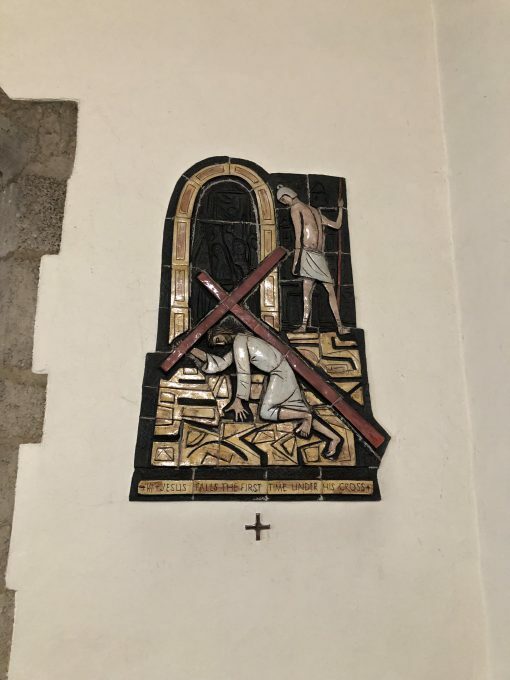 While in the Gulag he promised if he ever came out of this pit of despair and desperation that he would pay his gratitude to God in any way he could. 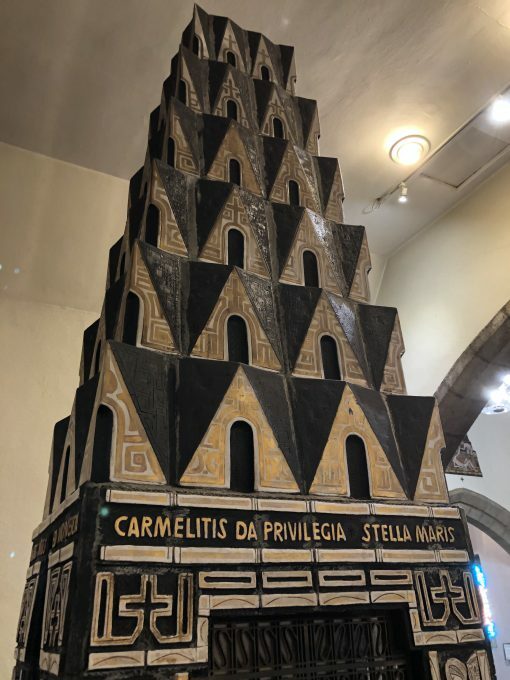 After winning a prize for an oil painting entitled Jesus Bearing the Cross in 1944, Kossowski was invited to join the Guild of Catholic Artists which led to Kossowski’s first major commission from Friar Lynch, the seven-panel History of the Carmelites of Aylesford. 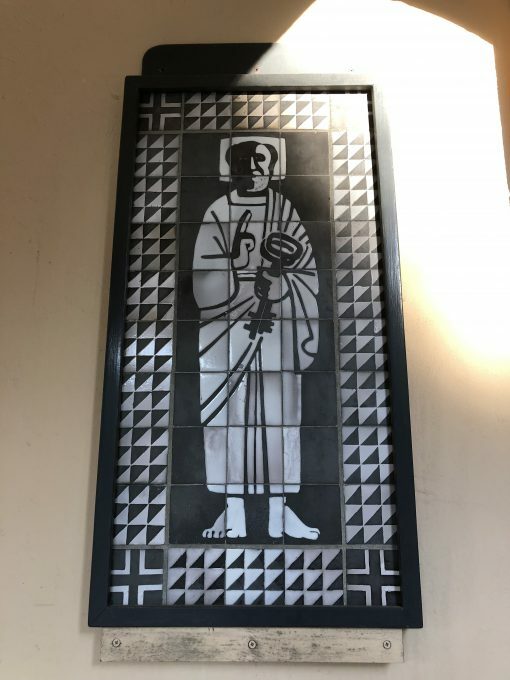 He was hesitant to undertake his next large ceramic project, a Rosary Way, but the Friar said he was definitely the man for the job and he set up base in the old Fulham Pottery and, using their old-fashioned kiln, heated by coal and coke which could get only one temperature and use one kind of glaze, Kossowski set about putting down colours and glazes that would work with one firing only with the temperature set very high to at least 1200 degrees. 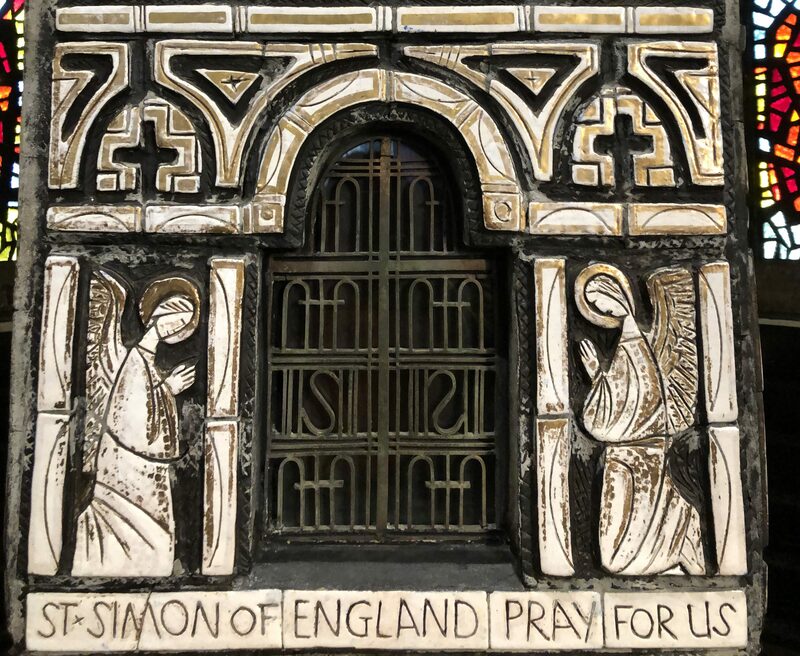 Often working until late into the night or the early hours of morning Kossowski created about a hundred distinct pieces of art in ceramic, tempera and oil painting, mosaic, wrought iron, and stained glass for the monks at Aylesford between 1950 and 1972, which you will see on a free walk around the Priory which is open 365 days of the year (although you would be well advised to check for pilgrimages if you want to avoid the crowds). 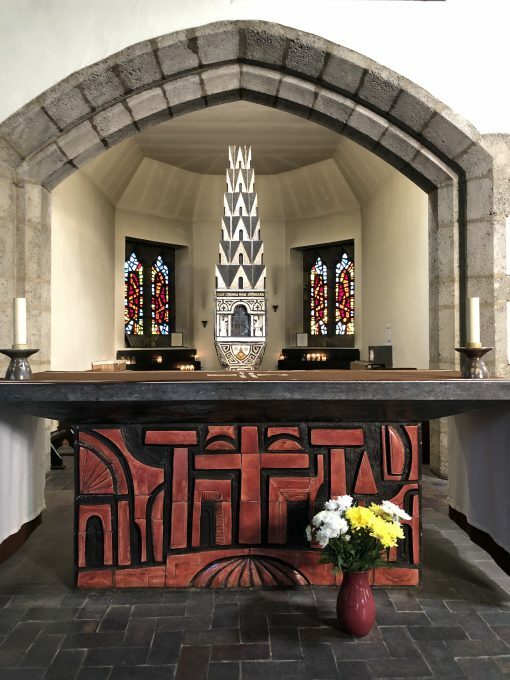 As you can see from the images, Kossowskis’ inexperience with ceramics is no doubt what brought a freshness to his first ceramic commission which fills two chapels and is dotted about the rest of the grounds. 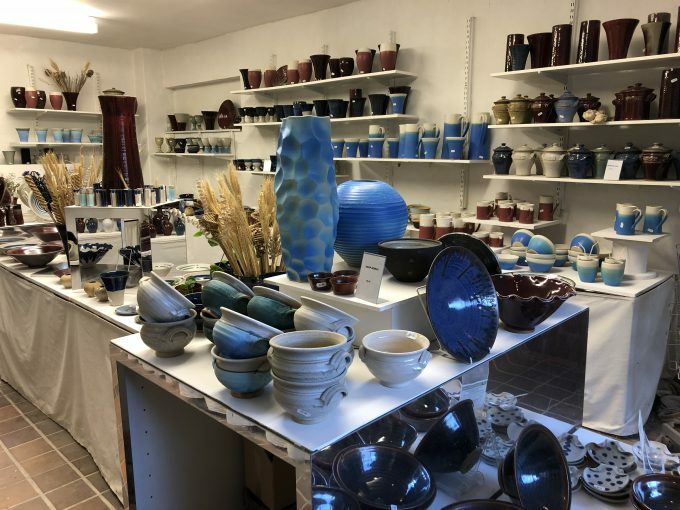 The priory has its own pottery too and shop where on site ceramicists will be happy to discuss their love of mid-century and modern ceramics. Feature written and photos taken by Lucy Ryder Richardson c Modern Shows Ltd. Please ask for permission from lucy@modernshows.com to reproduce any of this feature. The photo of The Priory is courtesy of Aylesford Priory.